Laughlin is an unincorporated town and census-designated place in Clark County, Nevada, United States, and a port located on the Colorado River. Discover how to plan a Laughlin trip in just a few steps with Inspirock's itinerary builder. Inglewood to Laughlin is an approximately 5-hour car ride. You can also fly. The time zone difference moving from Pacific Standard Time to Mountain Standard Time is 1 hour. Traveling from Inglewood in April, you will find days in Laughlin are a bit warmer (85°F), and nights are about the same (61°F). On the 18th (Thu), you're off toGrand Canyon National Park. On the 18th (Thu), hike the day away at Bright Angel Trail. Next up on the itinerary: engage your brain at Yavapai Geology Museum, take in breathtaking views at Yavapai Point, trek along South Kaibab Trail, and stroll through Rim Trail. To find where to stay, more things to do, ratings, and other tourist information, go to the Grand Canyon National Park trip itinerary planning tool . 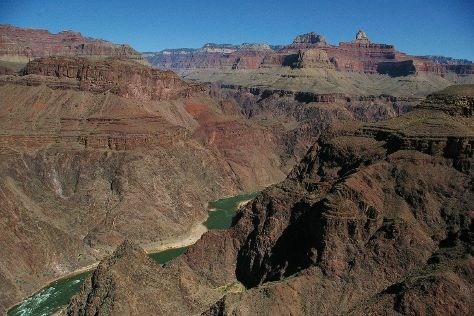 You can drive from Laughlin to Grand Canyon National Park in 3.5 hours. Prepare for cooler weather when traveling from Laughlin in April: high temperatures in Grand Canyon National Park hover around 62°F and lows are around 26°F. Finish your sightseeing early on the 20th (Sat) to allow enough time to drive back home.